Costimulation of TCR/CD3 and CD28 receptors leads to activation of the Jun kinase (JNK) cascade, which plays a key role in T cell activation, including activation of the IL-2 promoter. We demonstrate that the JNK cascade plays a central role in the activation of the CD28 response element (CD28RE) in the IL-2 promoter. This response element is linked to an activating protein-1 (AP-1) site, which functions synergistically with the CD28RE. The role of the JNK cascade in the activation of this composite element is twofold: 1) activation of the AP-1 site through transcriptional activation of c-Jun, and 2) activation of the CD28RE through selective cross-talk with IκB kinase-β (IKKβ). Dominant-negative versions of JNK kinase, c-Jun, and IKKβ interfered in CD3- plus CD28-induced CD28RE/AP-1 luciferase activity in Jurkat cells. In contrast, the dominant-active JNK kinase kinase, MEKK1, induced CD28RE/AP-1 luciferase activity, in parallel with induction of c-Jun and c-Rel binding to this combined promoter site. Dominant-active MEKK1 also induced transfected IKKβ, but not IKKα, activity. In contrast to the JNK cascade, the extracellular signal-regulated kinase (ERK) cascade did not exert an affect on the CD28RE/AP-1 site, but did contribute to activation of the distal NF-AT/AP-1 site. CD28 is a critical costimulatory receptor for the TCR and has been shown to participate in T cell proliferation 1 , inhibition of apoptosis 2 , prevention of anergy 3 , and induction of cytokine and chemokine production 4 . The role of CD28 as a signaling receptor has been most extensively studied for its contribution to activation of the IL-2 promoter 5, 6 . In the absence of CD28 coligation, the TCR fails to induce IL-2 production and may induce anergy or apoptosis 7 . The lack of IL-2 production in anergic T cells has been ascribed to a failure to activate important AP-13 response elements in the IL-2 promoter 8 . These findings predict that CD28 regulates an important signaling pathway that impacts AP-1 proteins and related response elements in the IL-2 promoter. It is important to learn more about this signaling pathway and its contribution to the biological function of the CD28 receptor. The minimal IL-2 promoter, which is comprised of approximately 300 bp upstream of the start site, contains binding sites for a variety of transcription factors, including the nuclear factor of activated T cells (NF-AT), Rel, and NF-κB proteins; octamer binding proteins; and AP-1 proteins 6, 9 . The binding and transcriptional activation of these factors are regulated by a complex array of signals delivered by the TCR and costimulatory receptors, including CD28 10 . These signals include contributions by protein tyrosine kinases, inositol phospholipid turnover, intracellular Ca2+ flux, calcineurin, protein kinase C, Ras, and mitogen-activated protein kinases (MAPK) 10 . CD28 makes an important contribution to the activation of the IL-2 promoter by stimulating a key response element, the CD28RE, which is situated 150–160 bp upstream of the start site 11 . While functioning as a c-Rel binding site 12 , full activation of the CD28RE is dependent on an adjacent AP-1 response element that is separated by only 2 bp from the CD28RE 12 . Moreover, data have been provided that a combination of the CD28RE and the adjacent AP-1 site functions as a composite response element that is regulated by c-Rel, c-Jun, and c-Fos 12, 13 . Mutational alteration of either the CD28RE or its accompanying AP-1 site disrupts the function of the CD28RE/AP-1 site 12, 13 . How does CD28 contribute to the coordinated binding and transcriptional activation of c-Rel and AP-1 proteins at the CD28RE/AP-1? Although it has been shown that the intracellular tail of CD28 interacts directly with a protein tyrosine kinase, the inducible T cell kinase as well as phosphatidylinositol 3-kinase 14, 15 , neither of these signaling components appear to be critical for IL-2 production 16, 17 . However, recent studies have shown that CD28 participates in the activation of the c-Jun N-terminal kinase or JNK cascade 18, 19 that regulates the expression and transcriptional activation of AP-1 proteins. The requirement for both TCR and CD28 ligation toward activation of this cascade is a unique feature of T lymphocytes and mirrors the dual receptor requirements for IL-2 production 18 . Moreover, a kinase-inactive version of the JNK kinase kinase, MEKK1, and a mutant c-Jun protein that lacks JNK phosphorylation sites have been shown to interfere in the transcriptional activation of the IL-2 promoter 18, 20 . One way to explain the role of the JNK cascade in the function of the IL-2 promoter is through the transcriptional activation of c-Jun, which may operate on any one of at least three modified AP-1 sites in that promoter, including the CD28RE/AP-1 6 . Another possible role for the JNK cascade is activation of the IκB kinase (IKK) complex, which is responsible for phosphorylation of IκB proteins 21, 22, 23 . The phosphorylation of IκBα and IκBβ leads to their degradation, with subsequent release of NF-κB proteins from the cytosol to the nucleus 24, 25 . It is interesting, therefore, that MEKK1 localizes in the IKK complex 26 , which acts as an integration site for the activation of IKKα and IKKβ 22, 23, 27 . Moreover, it has been shown that overexpression of MEKK1 leads to the selective phosphorylation and activation of IKKβ in 293 cells 28 . Since CD28 costimulation leads to c-Rel binding to the CD28RE/AP-1 12 , it appears to be a reasonable but unproven hypothesis that CD28 induces IKK activity. However, we do not know at this stage whether CD28 operates via MEKK1 or through the NF-κB-inducing kinase (NIK), which also localizes in the IKK complex 21, 22 . In light of the foregoing, we were interested in exploring the roles of the JNK and NF-κB kinase cascades in the activation of CD28RE/AP-1. Specifically, we were interested whether the JNK cascade acts upstream of both the c-Rel and AP-1 binding events, and whether this involves cross-talk between the JNK cascade and the NF-κB kinase cascades. Our data show that MEKK1 has potent stimulatory effects on both the CD28RE and AP-1 binding events at the CD28RE/AP-1. Since the effect of MEKK1 on the CD28RE involves IKKβ, but not IKKα, activation, it suggests that IKKβ may be activated downstream of MEKK1. OKT3 was acquired from Ortho Pharmaceuticals (Raritan, NJ), while the anti-CD28 monoclonal, mAb 9.3, was provided by Bristol-Meyers Squibb (Princeton, NJ). 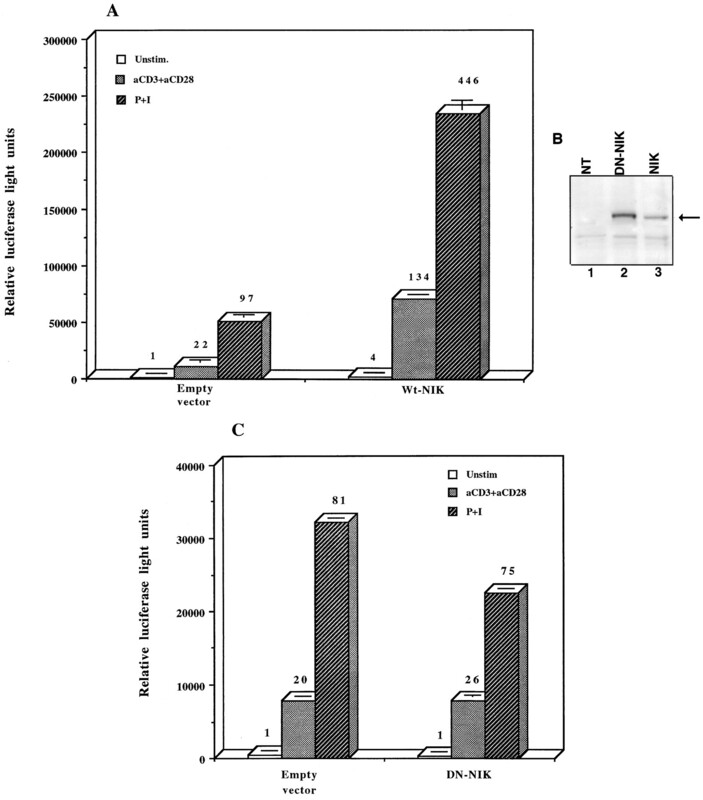 For Western blotting, anti-MEKK1, anti-IκB-α, and anti-IκB-β Abs were purchased from Santa Cruz Biotechnology (Santa Cruz, CA), anti-FLAG (M2) was attained from Sigma (St. Louis, MO), while an Ab to the hemagglutinin epitope tag (12CA5) was obtained from BabCo (Berkeley, CA). For supershift analysis, anti-c-Rel and anti-c-Jun were purchased from Santa Cruz Biotechnology (Santa Cruz, CA). Horseradish peroxidase conjugated to protein A was obtained from Amersham (Arlington Heights, IL). PD098059 was purchased from Alexis (San Diego, CA). The GST-c-Jun1–79 construct was provided by Dr. J. Woodgett (Ontario Cancer Institute, Ontario, Canada), while GST-IκBα1–100 protein was a gift from Dr. Anthony Manning (Signal Pharmaceutical, San Diego, CA). The tetracycline-repressible system, including the pTPH vector, was a gift from Dr. H. Bujard (Heidelberg, Germany) 29 . The cDNA for DA-MEKK-1 (MEKKΔ) was a gift from Dr. G. Johnson (National Jewish Center for Immunology and Research, Denver, CO) 30 . Dominant-active (DA-) MEKK1 was subcloned into the cloning site of the pTPH vector. Dominant-negative (DN-) JNK kinase (SEK1, MKK4) was provided by Dr. Leonard Zon (Harvard Medical School, Boston, MA) 31 . DA-MEK1 (MEK1-DN3/S218E/S222D) was provided by Dr. Natalie Ahn (Howard Hughes Medical Institute, Boulder, CO) 32 . Wild-type and kinase-inactive NIK constructs were provided by Dr. Michael Rothe (Tularik, South San Francisco, CA) 21 . The pCDNA1.1 vector was purchased from Invitrogen (San Diego, CA) and was used as an empty vector control in transfection studies or to keep DNA concentrations constant during transfection. Quadruplicate repeats of the CD28RE/AP-1 and its mutants, previously subcloned into the pΔODLO vector, were gifts from Dr. Art Weiss (Howard Hughes Medical Institute, San Francisco, CA) 12 . The wild-type CD28RE/AP-1 sequence was 5′-TTTAAAGAAATTCCAAAGAGTCATCA-3′, the CD28REm/AP-1 was 5′-TTTAAAGACCTCGAAAAGAGTCATCA-3′, and the CD28RE/AP-1 m was 5′-TTTAAAGAAATTCCAAATCAACATCA-3′. Underlines indicate the mutated regions. Jurkat-tTA cells (107) were transfected with 5–20 μg of the indicated vectors at 240 V and 950 mF in a Bio-Rad Gene Pulsar II (Hercules, CA). The Jurkat-tTA clone was generated by stable transfection with the pUHD15–1-neo vector as previously described 18 ; this vector encodes for a tetracycline-suppressible transcription factor, tTA. DA-MEKK1 expression from the pTPH vector was suppressed by 0.1 μg/ml tetracycline in the culture medium. Short term, stable DA-MEKK1 transfectants were generated by hygromycin selection (220 μg/ml) of pTPH-transfected Jurkat cells. Ten micrograms of the indicated reporter gene constructs were transiently transfected into 107 Jurkat-tTA cells. The cells were rested for 24 h and then stimulated with 10 μg/ml OKT3 or a combination of 2 μg/ml OKT3 and 2 μg/ml 9.3 mAb; 2 μg/ml OKT3, 2 μg/ml 9.3 mAb, and 1 ng/ml PMA; 100 nM PMA and 1 μg/ml ionomycin; or 100 nM PMA, 1 μg/ml ionomycin, and 2 μg/ml 9.3 mAb for 6 h. The cells were washed and lysed in luciferase buffer (Analytical Luminescence, Ann Arbor, MI), and luciferase activity was measured in 50 μg of lysate in a Monolight 2010 luminometer (Analytical Luminescence) 18 . Transfection efficiency was monitored by cotransfection of a β-galactosidase plasmid (CMV-β-Gal); β-galactosidase activity was used for adjusting luciferase values among cell populations transfected with different vector combinations. EMSA was performed as previously described 33 . In short, the double-stranded oligonucleotide, 5′-TTTAAAGAAATTCCAAAGAGTCATCA-3′, corresponding to position −166 to −140 of the IL-2 promoter, was end labeled using a Klenow reaction and [α-32P]dCTP (DuPont-New England Nuclear, Boston, MA). Nuclear extracts were prepared from unstimulated cells as well as cells treated with PMA and ionomycin or OKT3 and 9.3 mAb for 4 h or transfected with DA-MEKK1 as previously described 33 . Five to ten micrograms of nuclear extract was incubated with 10 ng of radiolabeled probe for 20 min at room temperature and separated on 4.5–5.0% polyacrylamide gels. For supershift analysis, nuclear extracts were preincubated with 1 μg of each respective Ab for 20 min before performing the binding reaction. Western blots were performed as previously described 18 . All blots were overlayed with a 1/1000 dilution of the primary Ab as indicated. Immunoblot analysis to assess IκBα/β turnover was performed according to the method of Lin et al. 34 . Jurkat-tTA cells were stimulated for 8 h with 2 μg/ml OKT3 plus 2 μg/ml 9.3 mAb. Cells were washed, and RNA was extracted using Trizol. RT was performed at 42°C in the presence of 2 U of reverse transcriptase and 20 μg of RNA. Semiquantitative PCR was performed as previously described 18 . Twenty micrograms of IKKα or IKKβ cDNA, encoding for FLAG-tagged proteins, was transiently transfected into 107 Jurkat-tTA cells. Cells were rested for 24 h, then were left untreated or were stimulated with stimuli similar to those mentioned above for 10 min. In a separate experiment, 20 μg of each kinase construct was cotransfected with pCMV-DA-MEKK1 or empty vector (pCDNA1.1). Cell lysates were precleared with protein G-Sepharose beads 23 . To these lysates we added 1 μg of anti-FLAG Ab bound to protein G-Sepharose for 1 h. Immune complexes were washed and equilibrated in kinase buffer as described by DiDonato et al. 35 . Kinase reactions were initiated by the addition of 10 μCi of [γ-32P]ATP (final ATP concentration, 10 μM) and 2 μg of the GST-IκB1–100 substrate. The reaction was performed for 30 min at 30°C. We have previously shown that activation of the JNK cascade by the TCR is dependent on CD28 costimulation 18 . The CD28 receptor is also critical for the induction of IL-2 secretion. A dominant interfering version of the JNK kinase kinase, MEKK(K432 M), interfered in CD28-induced IL-2 message expression 18, 19, 30 , suggesting that this signaling cascade plays an important role in activation of the IL-2 promoter. The likely sites of JNK involvement in that promoter are the AP-1 sites, such as the distal NF-AT/AP-1 element 6 . We have previously shown that DN-MEKK1 or a transcriptionally inactive c-Jun mutant interferes in activation of the distal NF-AT/AP-1 site 18 . The effect of the JNK cascade on activation of the CD28RE/AP-1 is unknown. Transient transfection of a quadruplicated CD28RE/AP-1 luciferase (Luc) construct into Jurkat cells followed by stimulation with anti-CD3 mAb, PMA, or PMA plus ionomycin (P+I) showed that reporter gene activity is enhanced by CD28 coligation (Fig. 1⇓A). To assess the effects of the JNK cascade on this reporter gene, we used tetracycline-suppressible DA-MEKK1 expression in Jurkat cells 18 . Removal of tetracycline from transiently transfected Jurkat-tTA cells leads to abundant DA-MEKK1 expression (Fig. 1⇓B); we have previously shown that this event leads to activation of the JNK cascade independent of other MAPK kinases 18 . Cotransfection of the CD28RE/AP-1 Luc construct 12 with the tetracycline-regulated DA-MEKK1 expression vector showed that DA-MEKK1 induced the activity of this reporter gene >2000-fold in cells grown in the absence compared with that in cells grown in the presence of tetracycline (Fig. 1⇓C). Moreover, this response was enhanced by P+I or P+I and anti-CD28 treatment (Fig. 1⇓C). Mutation of either the CD28RE site, which interacts with c-Rel 12 , or the AP-1 site, which interacts with c-Jun and c-Fos proteins 13 , dramatically impaired this DA-MEKK1-induced response (Fig. 1⇓C). These data show that DA-MEKK1 has a potent stimulatory effect on CD28RE/AP-1, which requires both transcription factor binding sites to mount a response. Activation of the CD28RE/AP-1 luciferase reporter by DA-MEKK1 in parallel with induced c-Jun and c-Rel binding to this element. A, CD28RE/AP-1 Luc assay showing the effects of different stimuli. Jurkat-tTA cells were transfected with 10 μg of 4xCD28RE/AP-1 Luc, rested for 24 h, and then stimulated with the range of stimuli for 6 h as described in Materials and Methods. Cells were lysed and assayed for luciferase activity. The fold increase (top of each row) was calculated against luciferase values obtained in untreated cells. B, DA-MEKK1 expression by a tetracycline-repressible system. Jurkat-tTA cells were transfected with 20 μg of pTPH into which we had subcloned MEKKΔ (DA-MEKK1). After incubating these cells for 24 h in the presence (+) or the absence (−) of 0.1 μg/ml tetracycline, cell lysates were analyzed by Western blotting, using the anti-MEKK1 Ab at a dilution of 1/1000. C, Reporter gene assay showing that both CD28RE and AP-1 binding sites are required for activation of CD28RE/AP-1 by DA-MEKK1. Jurkat-tTA cells were cotransfected with the reporter gene constructs and DA-MEKK1. Luciferase assays were performed 24 h later in cells grown in the presence or the absence of tetracycline. The fold increase was calculated against the luciferase value for unstimulated, tetracycline-positive (+) cells. D, EMSA showing c-Rel and c-Jun binding to the CD28RE/AP-1. Cells were transfected with DA-MEKK1 as in B and selected in hygromycin for 4 wk to obtain a relatively homogeneous MEKKΔ-expressing population. Twenty-four hours after removal of tetracycline, nuclear extracts were prepared from DA-MEKK1-expressing cells as well as untransfected cells stimulated with P+I or OKT3 plus 9.3 mAb. Gel shift assays were performed as previously described (33). Supershift analysis was performed by adding 1 μg of anti-c-Jun, anti-c-Rel, or nonimmune serum (NIS) to nuclear extracts from DA-MEKK1-expressing cells. To demonstrate that MEKK1 affects the binding of c-Rel and c-Jun to the CD28RE/AP-1, we transfected Jurkat-tTA cells with a tetracycline-suppressible DA-MEKK1 vector 18 . The cells were hygromycin selected for 4 wk to enrich the number of DA-MEKK1-expressing cells in the population. Nuclear extracts from these cells were used for conducting EMSAs, which showed that DA-MEKK1 induced a high m.w. shift complex similar in size to the shift complex obtained during CD3 and CD28 or P+I costimulation (Fig. 1⇑D). In previously published studies in which the same oligonucleotide probe was used, it was demonstrated that formation of the CD28-dependent shift complex was absolutely dependent on both c-Rel and AP-1 binding sites 12, 13 . Moreover, mutation of either the CD28RE or its accompanying AP-1 site interfered in the formation of this high m.w. shift complex 13 . To demonstrate that the DA-MEKK1-induced shift complex shown in Fig. 1⇑D contains c-Rel and c-Jun proteins, we preincubated nuclear extracts with Abs to c-Rel and c-Jun. Repeat of the EMSA demonstrated decreased binding as well as a size shift with anti-c-Rel, while the Ab to c-Jun showed decreased binding (Fig. 1⇑D). To demonstrate that more distal JNK cascade components are involved in the activation of CD28RE/AP-1, we looked at the effects of a kinase-inactive JNK kinase, SEK1/MKK4 (DN-SEK1) 31 , or a c-Jun mutant 20 on CD28RE/AP-1 Luc activity. First, we transfected DN-SEK1 together with CD28RE/AP-1 Luc into Jurkat cells. Upon stimulation with anti-CD3 and anti-CD28 mAb, DN-SEK1 decreased CD28RE/AP-1 Luc activity by 40% while inhibiting the P+I-induced response by almost 80% (Fig. 2⇓A). Moreover, a c-Jun mutant (TAM67), which lacks the transcriptional activation domain 20 , also interfered in CD28RE/AP-1 activation during CD3 and CD28 costimulation (Fig. 2⇓B). In contrast, overexpression of wild-type c-Jun enhanced CD3- and CD28-induced reporter gene activity almost fivefold (Fig. 2⇓B). This is in keeping with the stimulatory effect of c-Jun on this response element 13 . Taken together with the data in Fig. 1⇑, these findings demonstrate an important role for the JNK cascade in activation of the composite CD28RE/AP-1 element. Kinase-inactive SEK1/MKK4 and mutant c-Jun (TAM67) interfere in the activation of CD28RE/AP-1. A, DN-SEK1 decreases CD28RE/AP-1 Luc activity. Cells were transfected with 20 μg of an empty vector (pCDNA1.1) or with 20 μg of DN-SEK1 plus 10 μg of Luc vector and 6 μg of pCMV-βGal. After resting for 24 h, cells were stimulated with anti-CD3 plus anti-CD28 or P+I for 6 h as described in Fig. 1⇑A. 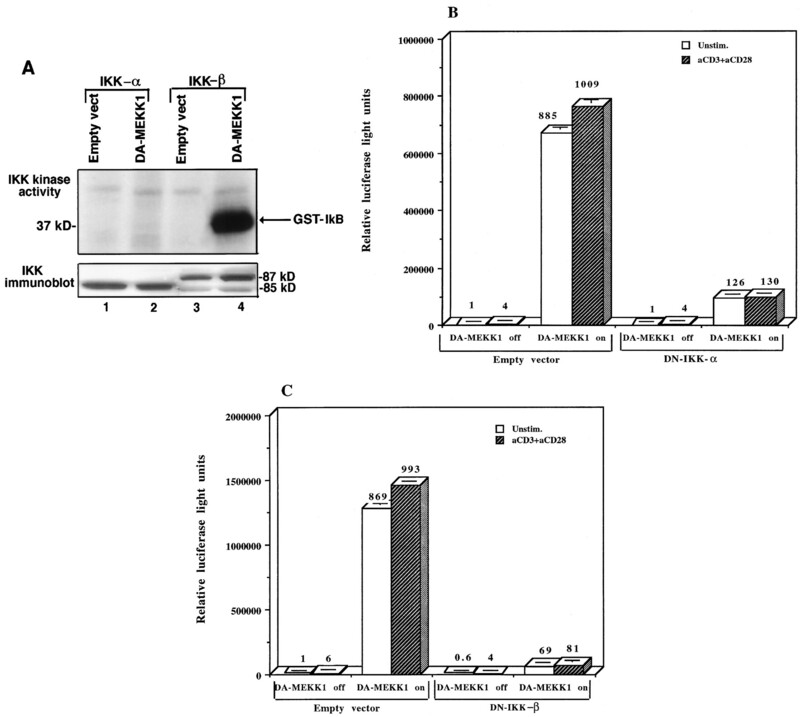 β-Galactosidase values were used to adjust for differences in transfection efficiency. B, Wild-type (wt-) c-Jun enhances, while DN-c-Jun decreases CD28RE/AP-1 activity. Cells were transfected with 20 μg of pCDNA1.1, 20 μg of wt-c-Jun, or 20 μg of DN-c-Jun together with 10 μg of the Luc vector and 6 μg of the β-Gal vector. The conditions for ERK activation differ from those for JNK activation in that the former cascade requires TCR ligation only 36 , while JNK activation requires TCR plus CD28 costimulation 18 . When both receptors are ligated, these cascades are activated contemporaneously, implying that the ERK cascade may contribute to activation of CD28RE/AP-1 and other AP-1 sites in the IL-2 promotor. The importance of the ERK cascade in activation of the IL-2 gene is confirmed by the potent inhibitory effect of a specific ERK kinase (MEK) inhibitor, PD098059, on induction of IL-2 message expression during CD3 and CD28 or P+I costimulation (Fig. 3⇓A). Moreover, PD098059 inhibited activation of the full-length IL-2 promotor-reporter gene stably transfected into Jurkat-tTA cells (not shown). However, when introduced during CD3- and CD28-induced CD28RE/AP-1 Luc activation, PD098059 did not exert an inhibitory effect (Fig. 3⇓B). In contrast, this drug had a potent inhibitory effect on the distal NF-AT/AP-1 Luc reporter (Fig. 3⇓C). This is in agreement with previous findings that the Ras/ERK cascade is important for activation of the distal NF-AT site 37, 38 . It should be noted that CD28 did contribute to the activation of the distal NF-AT/AP-1 response element (Fig. 3⇓C), which agrees with our previous data showing that CD28 does play a role in the activation of that site through JNK activation 18 . Taken together, the data in Fig. 3⇓ demonstrate that while ERK does not exert any effect on CD28RE/AP-1, this cascade is critical for activation of the intact IL-2 promotor, including activation of the distal NF-AT/AP-1 response element. PD098059, a specific MEK1 inhibitor, inhibits the expression of IL-2 message as well as activation of the distal NF-AT/AP-1, but does not interfere with activation of the CD28RE/AP-1 response element. A, RT-PCR assay showing absent IL-2 mRNA expression during cellular stimulation in the presence of PD098059. Jurkat-tTA cells were preincubated in 20 μM PD098059 (lanes 1–3) or 0.2% DMSO (lanes 4–6) for 30 min. Cells were stimulated for 8 h as described in Fig. 1⇑A. RT-PCR analysis was performed as previously described (18). 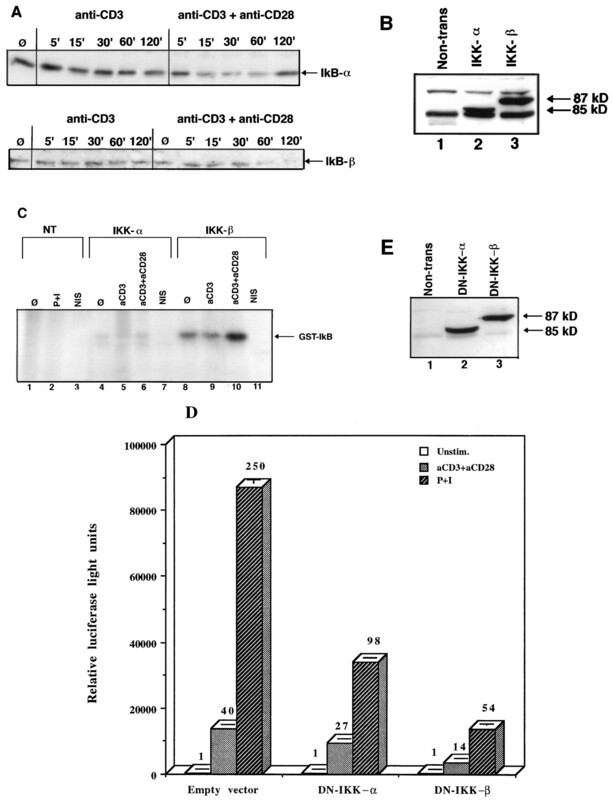 B, PD098059 fails to inhibit CD28RE/AP-1 reporter activity. Cells were transfected with the Luc vector, rested, and stimulated with anti-CD3 plus anti-CD28 or P+I in the presence or the absence of the drug for 6 h. C, PD098059 interferes in the activation of the distal NF-AT/AP-1 element. Cells were transfected with 10 μg of 4xNFAT/AP-1 Luc vector (pΔODLO), rested, and stimulated in the absence or the presence of 20 μM PD098059 for 6 h.
To directly compare the effects of the ERK and JNK cascades on transcriptional activation of CD28RE/AP-1, we used overexpression of a DA-ERK kinase, DA-MEK1 32 , and a DA-JNK kinase kinase, DA-MEKK1 30 , to determine their effects on CD28RE/AP-1 Luc activity. Immunoblotting analysis confirmed that equal amounts of these kinases were being expressed (Fig. 4⇓A). We also showed in immune complex kinase assays using cotransfection of epitope-tagged ERK2 and JNK1 cDNA that DA-MEK1 and DA-MEKK1 increased the respective kinase activities by >10-fold (data not shown). Cotransfection of the CD28RE/AP-1 Luc reporter showed that while DA-MEKK1 had a robust stimulatory effect on this reporter gene, the stimulatory effect of DA-MEK1 was negligible (Fig. 4⇓B). CD3 and CD28 or P+I stimulation enhanced CD28RE/AP-1 Luc activity in DA-MEK1-expressing cells, suggesting that ERK-independent signaling pathways play a role in the activation of that response element. These data confirm that the JNK cascade is the dominant MAP kinase cascade in activation of CD28RE/AP-1. CD28RE/AP-1 Luc reporter assay showing that expression of DA-MEKK1 leads to stronger stimulation than DA-MEK1. A, Western blot showing levels of DA-MEKK1 and DA-MEK1 expression. Cells were transfected with 20 μg of DA-MEK1 or 5 μg of DA-MEKK1 (supplemented with 15 μg of pCDNA1.1). DA-MEK1 was detected using the hemagglutinin tag, while DA-MEKK1 was visualized with an anti-MEKK Ab. B, Luciferase assay comparing the effects of DA-MEK1 and DA-MEKK1 on activation of CD28RE/AP-1. Cells were transfected with 20 μg of pCDNA1.1, 20 μg of DA-MEK1, or 5 μg of DA-MEKK1 (with 15 μg of pCDNA1.1) plus 10 μg of 4xCD28RE/AP-1 and 6 μg of pCMV-βGal. Cells were rested for 24 h and stimulated with anti-CD3 plus anti-CD28 or P+I for 6 h.
CD28RE/AP-1 is a composite response element that requires both c-Rel and c-Jun binding for optimal activity 12, 13 . For c-Rel to enter the nucleus, it is required that the IκB proteins IκBα and IκBβ, which sequester c-Rel in the cytosol, be phosphorylated. Phosphorylation of the IκB proteins leads to their ubiquination and proteolytic degradation 24, 25 . It is noteworthy that while CD3 ligation failed to induce IκBα or IκBβ degradation, simultaneous ligation of the CD3 and CD28 receptors did induce IκB degradation (Fig. 5⇓A). Interestingly, the kinetics of IκBα degradation are more expedient than the kinetics of IκBβ degradation (Fig. 5⇓A), which is in accordance with previously published data in nonlymphoid cells showing that IκBα degrades faster than IκBβ 39 . The phosphorylation of IκB proteins, which precedes their degradation, is regulated by two IκB kinases, IKKα and IKKβ, which localize in the multikinase cytosolic complex 21, 23 . IκB degradation and phosphorylation are regulated by CD28, which also induces IKKβ activation. A, Western blot showing IκBα and IκBβ degradation in response to CD3 plus CD28 coligation. Cells were stimulated with OKT3 or OKT3 plus 9.3 mAb for the indicated time periods. Cell lysates were analyzed by Western blotting using anti-IκBα or anti-IκBβ serum as previously described (34). B, Western blot showing the expression of transfected IKKα and IKKβ. 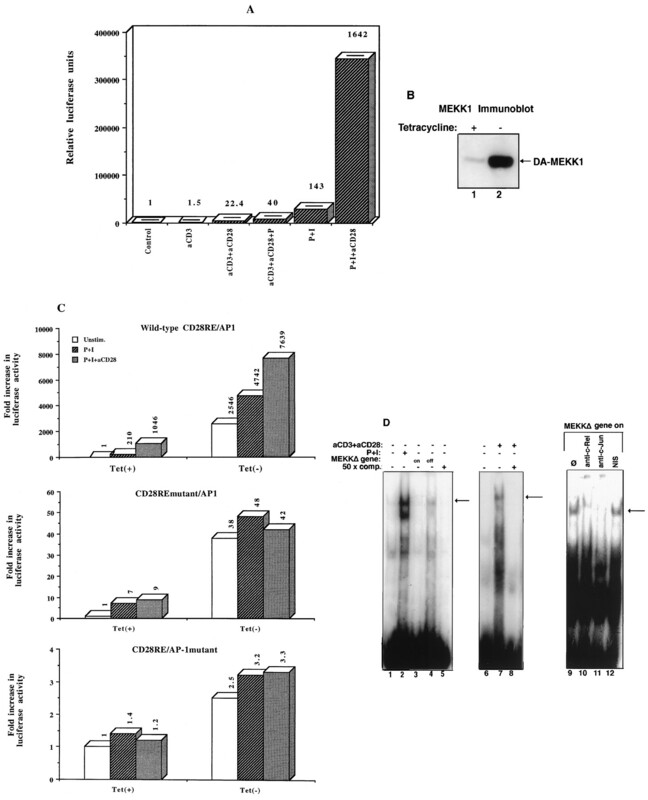 Cells were transfected with 20 μg of tagged IKKα or 20 μg of tagged IKKβ, then rested for 24 h. Cell lysates were precipitated with anti-FLAG (M2) Ab, and immunoprecipitates were subjected to immunoblotting. C, Immune complex kinase assay showing activation of IKKβ during CD28 costimulation. Cells were transfected as described in B. After 24 h, cells were stimulated with the indicated stimuli for 10 min. Cell lysates were immunoprecipitated with 1 μg of M2, and these precipitates were incubated together with GST-IκBα1–100 and [32P]ATP. The increase in IKKβ activity by CD28 costimulation was fourfold. D, DN-IKKs decrease CD28RE/AP-1 Luc activity. Cells were transfected with kinase-inactive IKK constructs or an empty vector together with 10 μg of Luc plus 6 μg of β-Gal vector. Luciferase assays were performed after cellular stimulation with the indicated stimuli for 8 h. E, Western blot showing equivalent levels of DN-IKKα and DN-IKKβ expression. Anti-FLAG immunoprecipitates, obtained as described in D, were analyzed by anti-FLAG immunoblotting. The data in Fig. 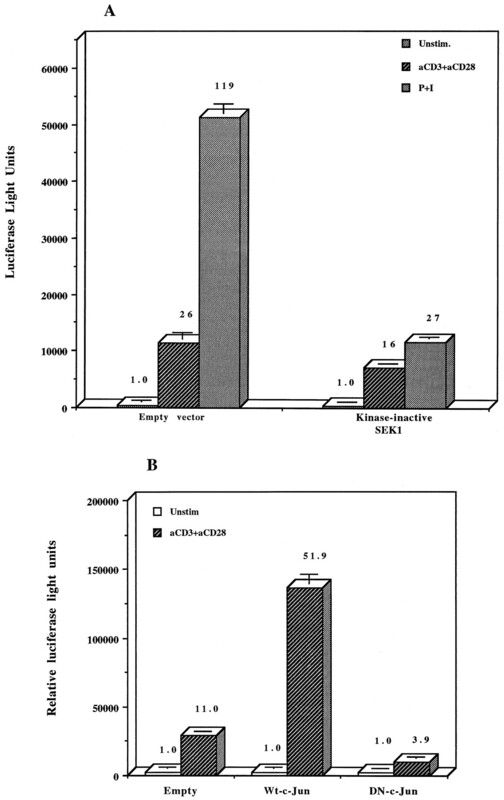 5⇑A suggest that CD28 coligation induces IKK activity. To address this question, we studied IKKα and IKKβ activation using an immune complex kinase assay 23 . FLAG-tagged IKKα and IKKβ were transfected into Jurkat cells and recovered by anti-FLAG immunoprecipitation. Immunoblotting analysis with an anti-FLAG antiserum showed that equivalent amounts of the 85-kDa IKKα and 87-kDa IKKβ proteins were being recovered (Fig. 5⇑B). Coincubation of these immunoprecipitates with GST-IκBα1–100 and [γ-32P]ATP showed definitive induction of IKKβ kinase activity in cells treated with anti-CD3 and anti-CD28 mAb, but not in cells treated with anti-CD3 mAb alone (Fig. 5⇑C). In contrast, CD3 and CD28 costimulation failed to induce IKKα activity (Fig. 5⇑C, lanes 4–7), demonstrating that IKKβ is selectively activated by CD28 costimulation. These results are in contrast with those using RAW 264.7 cells, which upon transfection with similar constructs showed that IKKα, but not IKKβ, activity was induced by bacterial LPS 40 . To confirm that IKK activity is required for activation of CD28RE/AP-1, we looked at the effect of kinase-inactive IKKα and IKKβ 21, 23 on CD28RE/AP-1 Luc activation during CD3 and CD28 or P+I treatment. This was accompanied by cotransfecting kinase-inactive versions of these IKKs together with CD28RE/AP-1 Luc into Jurkat cells. The data show that both kinase-inactive IKKs acted in a DN fashion and interfered in the induction of reporter gene activity (Fig. 5⇑D). While DN-IKKα decreased CD3- and CD28-induced activity by 33%, inhibition by DN-IKKβ approximated 65% (Fig. 5⇑D). Similar decreases were seen in P+I-treated cells (Fig. 5⇑D). These differences were not due to differences in the relative abundance of the DN kinases being expressed, as immunoblotting showed equal staining intensity for DN-IKKα and DN-IKKβ proteins (Fig. 5⇑E). The inhibitory effect of DN-IKKα in this assay is not totally understood, but it may relate to the ability of IKKα and IKKβ to heterodimerize in the multikinase complex 21, 23 . In this regard, Zandi et al. have shown that DN-IKKα or -IKKβ mutants can interfere in induction of TNF-α-induced IκB kinase activity as well as nuclear translocation of Rel proteins in 293 cells 23 . One possible explanation is that DN-IKKα may sequester endogenous IKKβ into a catalytically inactive complex. This idea requires further study. A key question is how IKKβ is activated by CD28 costimulation. Conceptually, two pathways may be involved. The first pathway is IKK activation via the NF-κB-inducing kinase, NIK, which localizes in the multikinase complex 21, 22 . The second possibility is IKKβ activation by MEKK1, which also assembles in the IKK complex 26 . While overexpression of wild-type NIK enhanced CD3- and CD28-induced or P+I-induced CD28RE/AP-1 Luc activity (Fig. 6⇓A), overexpression of kinase-inactive NIK (Fig. 6⇓B) had no or only a minimal inhibitory effect on reporter gene activity (Fig. 6⇓C). While it was not possible to study NIK activation directly due to a lack of reagents, the data in Fig. 6⇓C argue against a significant role for NIK in CD28 costimulatory events. Moreover, there is no evidence that the TRAF proteins, which are required for NIK activation by cytokine receptors, are involved in TCR or CD28 signaling 21 . While wild-type NIK (wt-NIK) increases CD28RE/AP-1 Luc activity, DN-NIK does not interfere in the activation of this response element. A, The wt-NIK enhances CD28RE/AP-1 Luc activity. 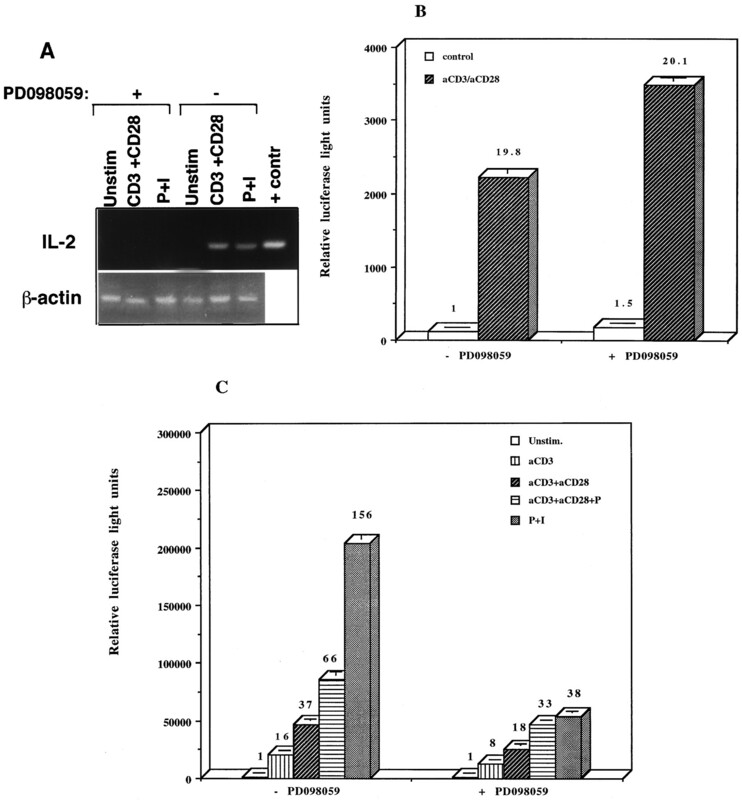 Cells were transfected with 20 μg of pCDNA1.1 or 20 μg of wt-NIK together with 10 μg of the Luc vector and 6 μg of pCMV-βGal. After resting for 24 h, cells were stimulated for 8 h. B, Western blot showing DN-NIK and wt-NIK expression. Cells were transfected with 20 μg of DN-NIK or 20 μg of wt-NIK and then rested for 24 h. Cell lysates were analyzed with a 1/1000 dilution of M2 Ab. C, DN-NIK does not interfere in activation of the CD28RE/AP-1 Luc reporter. Cells were transfected with 20 μg of pCDNA1.1 or 20 μg of DN-NIK together with 10 μg of the Luc vector and 6 μg of pCMV-βGal. After resting for 24 h, cells were stimulated as indicated for 8 h.
Since the dual receptor (CD3 and CD28) requirements for MEKK1 and IKKβ activation are identical (Fig. 5⇑C), we looked at possible cross-talk between these kinase pathways. In our first approach, we cotransfected expression vectors for FLAG-tagged IKKα or IKKβ with DA-MEKK1. We also used an empty vector in the place of DA-MEKK1 as a control. In the presence of the empty vector, no activation of IKKα or IKKβ could be seen in the in vitro kinase assay (Fig. 7⇓A). In contrast, overexpression of DA-MEKK1 had robust stimulatory effects on IKKβ activity, but did not induce IKKα activity (Fig. 7⇓A). These differences were not due to differences in the abundance of IKKα or IKKβ being expressed as demonstrated by anti-FLAG immunoblotting (Fig. 7⇓A, inset). The data in Fig. 7⇓ are in agreement with selective IKKβ activation during CD3 and CD28 costimulation (Fig. 5⇑) and also agree with the findings of a recent study in 293 cells, which showed that DA-MEKK1 transfection induced IKKβ activity selectively 28 . DA-MEKK1 preferentially induces IKKβ kinase activity, while kinase-inactive IKKα and IKKβ constructs inhibit CD28RE/AP-1 Luc activation. A, In vitro kinase assay looking at the activation of IKKs by DA-MEKK1. Jurkat-tTA cells were transfected with either wt-IKKα or wt-IKKβ together with an empty vector or pCMV-DA-MEKK1. After resting for 24 h, cells were lysed, and in vitro kinase assays were performed as described in Fig. 5⇑C. The bottom panel is an anti-FLAG immunoblot to demonstrate that equivalent amounts of IKKα or IKKβ protein were expressed. B, DA-MEKK1-induced CD28RE/AP-1 Luc activity is negatively regulated by DN-IKKα. Cells were transfected with 20 μg of pTPH(DA-MEKK1), 10 μg of the Luc vector, 6 μg of pCMV-βGal, and either 20 μg of pCDNA1.1 or 20 μg of DN-IKKα. Transfected cell populations were divided into aliquots receiving 0.1 μg/ml tetracycline (gene off) or no tetracycline (gene on) for 24 h. Cells were left unstimulated or were stimulated with OKT3 plus 9.3 mAb for an additional 6 h. C, DA-MEKK1-induced CD28RE/AP-1 Luc activity is negatively regulated by DN-IKKβ. The assay was performed as described in B, except for the use of a DN-IKKβ in place of a DN-IKKα expression vector. A second approach for studying the interaction between MEKK1 and IKKs was to look at the effects of DN-IKKα and DN-IKKβ on DA-MEKK1-induced activation of CD28RE/AP-1. DN-IKKα and DN-IKKβ were cotransfected with DA-MEKK1 into tetracycline-regulated Jurkat tTA cells. Anti-FLAG immunoblotting showed comparable amounts of kinase-inactive IKKα or IKKβ being expressed (not shown). While DA-MEKK1 expression in the absence of DN-IKKs induced an 885-fold increase in CD28RE/AP-1 Luc activity, coexpression of DN-IKKα limited this response to 126-fold (Fig. 7⇑B). The addition of anti-CD3 plus anti-CD28 mAb could not overcome this inhibition (Fig. 7⇑B). In an identical experiment in which DN-IKKβ was cotransfected with DA-MEKK1, an 869-fold induction of luciferase activity by DA-MEKK1 was reduced to 69-fold stimulation by kinase-inactive IKKβ (Fig. 7⇑C). These data are in agreement with those presented in Fig. 5⇑D that show that DN-IKKα interferes in CD28RE/AP-1 activity despite the lack of stimulation by CD28. We have discussed above the possible reasons for this finding. In this paper we show that the JNK cascade plays a central role in the activation of a key regulatory element in the IL-2 promoter, i.e., the composite CD28RE/AP-1. The role of the JNK cascade is twofold, namely activation of the AP-1 site via transcriptional activation of c-Jun as well as activation of the CD28RE via an in-series linked NF-κB regulatory pathway. In this regard, we have shown that DA-MEKK1 induces IKKβ activity, which mirrors selective activation of IKKβ by CD3 plus CD28 costimulation. The cross-talk between the JNK and NF-κB kinase cascades at the level of the IL-2 promoter may play an important role in the decision of T cells to proliferate or become anergized. Despite its powerful effect on T cell responses, details about the molecular activation pathways induced by the CD28 receptor are incomplete. While earlier studies have focused on the roles of two signaling molecules that can interact with the pYMNM motif in the tail of the CD28 receptor 14, 20 , i.e., the inducible T cell kinase and phosphatidylinositol 3-kinase, more recent studies have cast doubt on their importance in stimulatory CD28 events 16, 17 . Instead, a number of additional signaling molecules have been proposed to be important in CD28 signaling, namely NF-κB transcription factors 12 , the JNK cascade 18 , the ceramide-sphingophospholipid pathway 41 , Rac1, and the p21-activated kinases 42 . Moreover, the activities of Rac1, p21-activated kinase 1, and MEKK1 are linked 42 , implying that these signaling components may converge on or synergize in the activation of a final common signaling pathway, the JNK cascade. In this communication we demonstrate that the JNK cascade is critical for the transcriptional activation of the IL-2 promoter via the composite CD28RE/AP-1 (Figs. 1⇑ and 2⇑). This response requires both the c-Rel and AP-1 binding elements in the CD28RE/AP-1 (Fig. 1⇑). The role of the JNK cascade toward the activation of this composite response element is dependent on dual contributions by the afferent JNK cascade component, MEKK1, namely activation of the IKKβ cascade as well as activation of the the downstream JNKs (Figs. 1⇑ and 5⇑). The transcriptional activation of c-Jun is dependent on JNK-mediated phosphorylation of serine residues in the N-terminal domain of that transcription factor 43, 44 . In this regard it is relevant that the c-Jun mutant, TAM67 20 , which lacks a transcriptional activation domain, acted in a DN fashion to suppress transcriptional activation of the IL-2 promoter (Fig. 2⇑). An additional role for the JNK cascade in the activation of the IL-2 promoter may be increased expression of c-Jun protein through transcriptional activation of its promoter 45 . This effect is mediated by JNK phosphorylation of c-Jun and ATF2, both of which act on modified AP-1 sites in the c-Jun promoter 46 . In addition to its role in the transcriptional activation of the IL-2 gene, the JNK cascade regulates the stability of the IL-2 message via cis-acting elements in the 5′ and 3′ untranslated regions of the mRNA 47 . The JNK cascade is one of three mammalian MAP kinase cascades that play a role in T cell activation. At least one other MAPK, the ERK cascade, plays a role in activation of the IL-2 promoter 37, 38 . While the ERK cascade is activated by TCR/CD3 ligation alone, the JNK cascade requires dual ligation of the TCR/CD3 and CD28 receptors for its activation 18 . This mode of JNK activation is unique to T cells and probably involves synergistic signaling by TCR and CD28 pathway components 48 . The balance between the JNK and ERK cascades appears to be important in cellular decision making in T lymphocytes. Based on findings that ERK inhibition by a drug or DN-MEK1 38, 49 or JNK inhibition by DN-MEKK1 18 interferes in CD3- plus CD28-induced IL-2 mRNA expression, both MAPK cascades are required for IL-2 production and T cell proliferation. Based on our current findings, we propose that these MAP kinase cascades synergize in the activation of the modified AP-1 response elements in the IL-2 promoter. While the distal NF-AT/AP-1 element is activated by both cascades (Fig. 3⇑C) 18, 37 , the CD28RE/AP-1 appears to be under the dominant regulation of the JNK cascade (Fig. 4⇑B). Although a number of cytokines, such as IL-1α and TNF-α, are able to activate JNK and NF-κB pathways concomitantly, the CD28 receptor has not been shown to recruit the TRAF proteins that are required to engage both pathways independently 21, 22 . Instead, it appears that CD28 ligation leads to sequential activation of these pathways, i.e., primary activation of the JNK cascade, which subsequently induces NF-κB activity. The following evidence favors this idea: 1) induction of IKKβ activity by DA-MEKK1 in Jurkat cells (Fig. 7⇑A), 2) the inhibitory effect of DN-IKKβ on DA-MEKK1 or CD3- plus CD28-induced CD28RE/AP-1 Luc activity (Fig. 7⇑C), and 3) the induction of c-Rel binding to the CD28RE/AP-1 probe by DA-MEKK1 (Fig. 1⇑D). While the exact mechanism by which MEKK1 communicates with IKKβ is unknown, we know that the former kinase localizes in the IKK complex 26 . This is a large molecular mass (>700 kDa) cytosolic complex that recruits and integrates signals from multiple kinases 22, 23, 27 . It remains to be proven whether MEKK1 phosphorylates IKKβ directly or uses an intermediary kinase. The selectivity for the activation of exogenous IKKβ after DA-MEKK1 transfection is surprising in light of the fact that IKKβ and IKKα activities are functionally linked through heterodimerization 23, 27 . However, Jurkat cells are not the only cells in which DA-MEKK1 transfection leads to selective IKKβ activation, as the same observation has been made in 293 cells 28 . In contrast to the effect of MEKK1, another NF-κB-inducing kinase, NIK, has been shown to activate IKKα predominantly, with minor effects on IKKβ activity 28 . We have been able to confirm this observation in Jurkat cells (not shown). Although NIK overexpression in Jurkat cells leads to NF-κB activation and enhancement of CD28-induced CD28RE/AP-1 Luc activity (Fig. 6⇑A), we do not think that this kinase plays a role in CD28-induced responses. First, kinase-inactive NIK does not inhibit CD3- and CD28-induced CD28RE/AP-1 Luc activity (Fig. 6⇑C), and second, the TRAF proteins necessary for NIK activation have not been shown to interact with the CD28 receptor. At the same time, however, IKKβ activity is relevant to CD28 function, since this kinase was activated by CD3 and CD28 stimulation (Fig. 5⇑C). Moreover, IκBα and IκBβ proteins are degraded by CD3 and CD28 costimulation but not in response to anti-CD3 treatment alone (Fig. 5⇑A). Taken together, our data demonstrate that the principal activation pathway involved in the CD28RE/AP-1 element is the JNK cascade, which secondarily leads to NF-κB activation. In addition to enhancing our understanding of the activation, the findings in this manuscript are of importance in understanding the regulation of anergic responses in T cells 7 . A hallmark of anergic T cells is the inability of their TCR to engage either the ERK or JNK cascade, even with appropriate CD28 costimulation 50 . In addition to these signaling defects, anergized T cells exhibit an actively maintained state of nonresponsiveness, which has been ascribed to poorly identified anergy factors 7 . It has been proposed that these anergy factors are produced in response to TCR ligation. When considered from the perspective of the MAP kinase cascades, JNK activation during CD28 costimulation may act to suppress the induction of these anergy factors. Alternatively, ERK activation in the absence of JNK costimulation may play a role in the TCR-induced expression of these anergy factors. However, there is at least one report in the literature that indicates that pharmacologic ERK inhibition, although effective in blocking T cell proliferation, does not prevent the induction of anergy 51 . Nonetheless, the role of MAP kinase cascades in the induction or maintenance of anergy holds promise in the therapeutic manipulation of Ag responsiveness. This study is also of some importance in understanding the regulation of apoptosis in T cells. In this regard, it is known that CD28 interferes in TCR-induced apoptotic pathways 2 . The ability of CD28 to induce NF-κB activation may be relevant, since NF-κB pathways have been linked to antiapoptotic effects in lymphocytes 52 . It is somewhat of a paradox, therefore, that CD28 costimulation is also associated with JNK activation, because the JNK cascade has been linked to proapoptotic events in T cells, e.g., Fas ligand expression 53 . We have recently identified a modified AP-1 response element in the Fas ligand promoter that is regulated through JNK by stress stimuli, e.g. UV and gamma irradiation 33 . The solution to this apparent paradox appears to reside in the kinetics of JNK activation; while CD28 costimulation leads to transient JNK activation, stress stimuli induce prolonged JNK activation 53, 54 . Taken together, the kinetics of JNK activation may play an important role in determining whether T cells produce IL-2 and proliferate or express Fas ligand and commit to apoptosis. In summary, we have provided evidence that activation of the JNK cascade by CD3 and CD28 costimulation plays a critical role in the activation of the IL-2 promoter. We propose that the JNK cascade is a major component of signal 2, which is used by CD28 to assist TCR-induced signal 1 toward full T cell activation. ↵1 This work was supported by U.S. Public Health Service Grants AG14763 and AG14992. ↵3 Abbreviations used in this paper: AP-1, activating protein-1; NF-AT, nuclear factor of activated T cells; MAPK, mitogen-activated protein kianse; CD28RE, CD28 response element; JNK, N-terminal Jun kinase; IκB, inhibitor of κB factor; MEKK1, mitogen-activated protein kinase kinase kinase 1; IKK, inhibitor of κB factor kinase; NIK, nuclear factor-κB-inducing kinase; DA, dominant-active; DN, dominant-negative; MEK1, mitogen-activated protein kinase kinase 1; SEK1, stress-activated protein/N-terminal Jun kinase kinase 1; GST, glutathione S-transferase; EMSA, electrophoretic mobility shift assay; P+I, PMA plus ionomycin; ERK, extracellular signal-regulated kinase. Hiura, T., S. Kempiak, and A. Nel. 1999. Activation of the human RANTES gene promoter in macrophage cell line by lipopolysaccharide is dependent on stress-activated protein kinases and the IκB kinase cascade: implications for exacerbation of allergic inflammation by environmental pollutants. Clin. Immunol. In press.